The hymn that Patter has given us for this challenge is one that I am not familiar with. 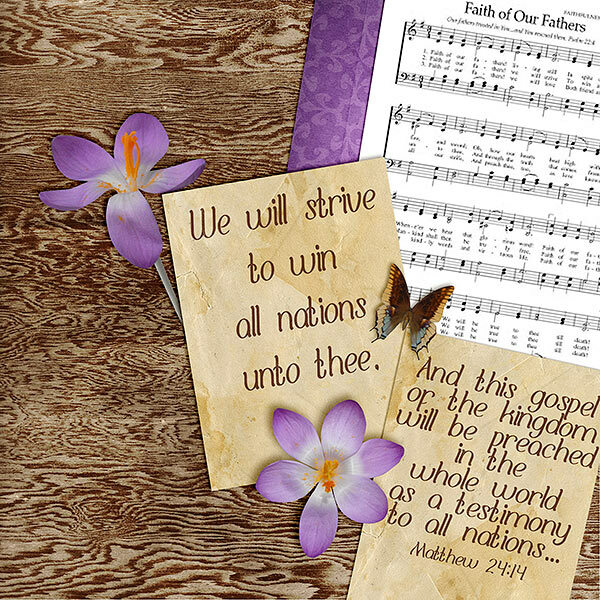 As I read through the words of the hymn the words "We will strive to win all nations unto thee" stood out to me so I found a scripture which goes well with those words. The Matthew 24:14 which I have shared on my digital page stops before some very important words but I chose to not share those on my page as they did not go with the hymn's words. But I will share them now...."And this gospel of the kingdom will be preached in the whole world as a testimony to all nations, and then the end will come." This end Jesus spoke of, is His second coming. I believe that once the gospel reaches all peoples in the world He will return. That time is not far away and with so much bad happening in our world, I say as Revelation 22:20 says "Amen. Come, Lord Jesus." How beautiful this is! Wow! What a wonderful page ,the woodgrain background is really effective!